Honestly, I don’t know how red velvet should taste like. I tried googling “What should red velvet taste like” and found that I’m not alone after all. I can’t put a name on its taste – it’s slightly chocolatey, but not overpowering. It’s not very sweet, but top it with a nice cream cheese frosting and you’ve got your sweet tooth satisfied! I’d recommend making it for people who are not fans of very sweet cupcakes like my parents (they liked it very much). 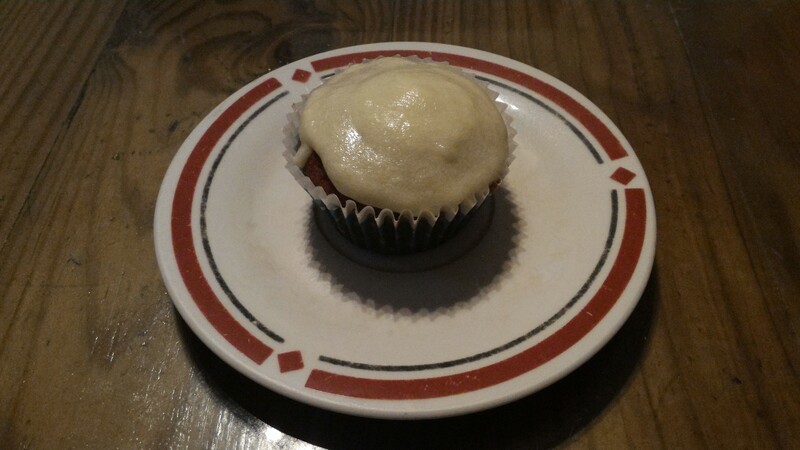 And I must admit, I cannot deny the bragging rights it gave me when I told them I baked red velvet cupcakes haha! How about you? Do you have a funny red velvet story? This recipe I found in the internet1 but adjusted some of the amounts based from some suggestions in the comments. 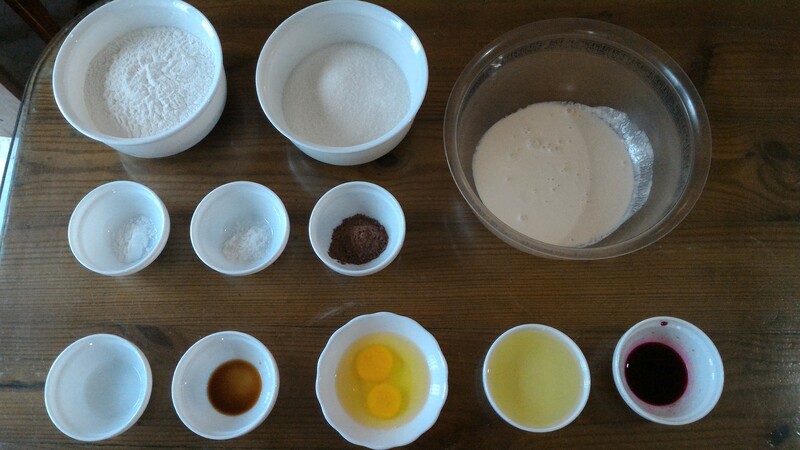 Mix dry ingredients (flour, sugar, baking soda, salt and cocoa powder) in a separate bowl. 2. Mix wet ingredients (oil, buttermilk, eggs, food coloring, vinegar and vanilla) in a large bowl. TIP: If you don’t have buttermilk in stock, you can make your own buttermilk by mixing 1 cup milk (I use evaporated milk) with one teaspoon of white vinegar. Just wait for 10-15 minutes to allow the milk to curdle then voila! You’ve got your own homemade buttermilk. Mix wet (pink) and dry (right) ingredients together until well-combined. a. Line your cupcake pan with cupcake liners, or grease it with baking spray or butter. b. Fill the cupcake pans up to about 2/3 full. Be sure to leave space for the cupcakes to rise. c. Once you’re done with preheating, you can start baking! Bake at 350 deg F (176 deg C) for 20-22 minutes. TIP: If you have multiple cupcake pans, you can bake them simultaneously – just be sure to change their places in the middle of your baking time to ensure equal cooking. Take out the butter and cream cheese from the fridge. Place in a bowl and set aside to soften. Combine softened butter and cream cheese. 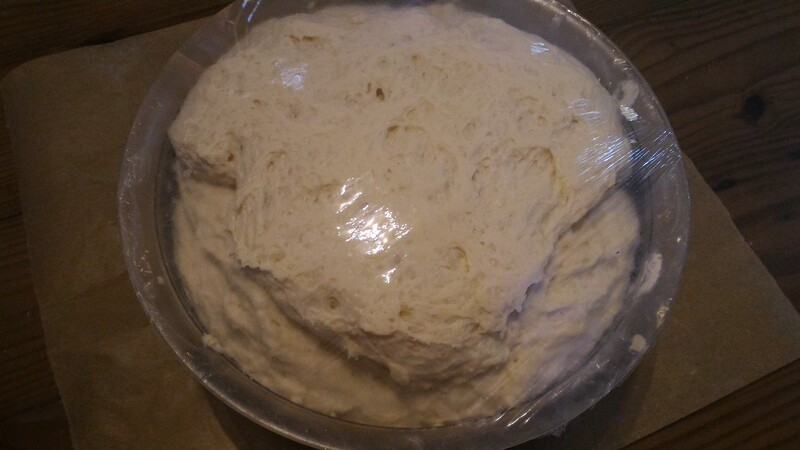 Sift the confectioner’s sugar then mix with butter-cream cheese mixture. For those with mixers, you can first opt to mix it slowly to combine the ingredients well then switch to fast-mixing until the frosting becomes light and fluffy. 5. Refrigerate the cream cheese frosting to thicken before piping on cupcakes! If you want a more chocolatey taste, you can add 1 more teaspoon of cocoa powder. There are a lot of issues with food coloring – being synthetic and not good for your health. You can use natural dyes but they’re a little bit pricey, or beets if they’re readily available to you. But if you’re making it for your family, or just a couple of friends – you can just cut it down or opt to not use any food coloring at all. A reddish brown mixture results from the reaction of baking soda, vinegar, buttermilk and cocoa1 – not as red as ones we know red velvet cupcakes are, but at least it’s guilt free! The 6 leftmost ones were the first batch where I used half a tbsp of food color. The second and third ones I added half a tbsp more each. The 3 tbsp of food coloring in the ingredient list uses liquid coloring based from the original recipe1. It should give you a deep red color like the ones in the 5th and 6th column. The three rightmost cupcakes were a little dry, maybe because they were too few for a batch (3 instead of 6). I’ll surely make these again, but next time I’ll try to use a 1/8 cup measure to fill my cupcake pans. This should give us around 24 cupcakes! My parents are watching their sugar intake, so they ate these cupcakes with little or no frosting at all (Like seriously?) – That’s why I had a lot of leftover cream cheese frosting. But don’t worry, it goes well with a lot of cupcakes (or admit it you‘re gonna eat it on its own! ).